Total knee replacements have become one of the most successful procedures in all of medicine, with the first knee replacement surgery performed in 1968. Since that time, there have been many improvements made in surgical techniques as well as surgical materials that have greatly increased the outcomes of knee replacement surgery. Knee replacement surgery is used when the knee has undergone severe damage – either by arthritis or injury. Damage to the knee can result in the loss to perform simple day to day activities including walking or climbing stairs and can even have an impact while sitting or lying down due to pain. 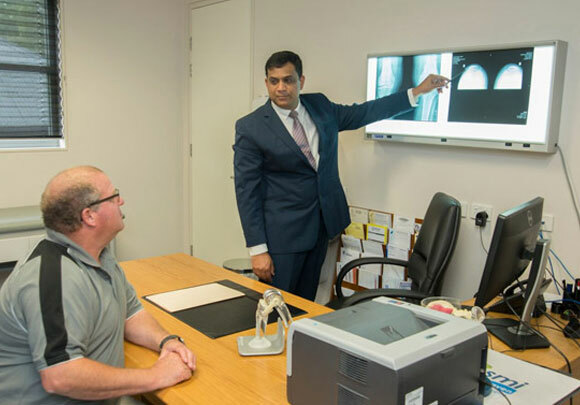 When non-surgical conservative methods of treatments including weight loss, physiotherapy, medications, injections and use of walking supports stop being of help, your doctor will suggest you that you consider total knee replacement surgery. Total knee joint replacement surgery is safe and has been proven as an effective procedure to relieve pain as well as provide correction of leg deformity and assist you in the resumption of normal activities. Who is suitable for total knee replacement surgery? There is no guideline to determine the eligibility for the total knee replacement surgery and factors such as age, type or severity of arthritis and body weight does not impose any restrictions on suitability of the surgery. Dr Goudar takes each individual person’s lifestyle into consideration before undertaking this surgery. His recommendations for total knee replacement surgery will be based on a number of factors and will take into account each patient’s pain and disability level. The majority of patients undergoing knee replacement surgery are aged between 50 to 80 years; however successful total knee replacements have been performed successfully on patients of all ages when identified as necessary including patients who are young teenagers with juvenile arthritis and elderly patients with degenerative arthritis. Dr Anil can also provide ACL and knee arthritis expertise. If you need knee replacement surgery, call us for more information, and we can assist you in getting a referral from your GP.